I’ve thought of making one of these for fun, so today I finally did it. Who knows what great uses I’ll find for this clamp? The wood is mahogany and the finish is boiled linseed oil. This is an old style clamp that does not have reverse threads on half of the rod. It may be a bit dodgy to use, but it was made by me. I originally intended to make 3 of these, but I fudged the wooden parts for two of them. Handy! 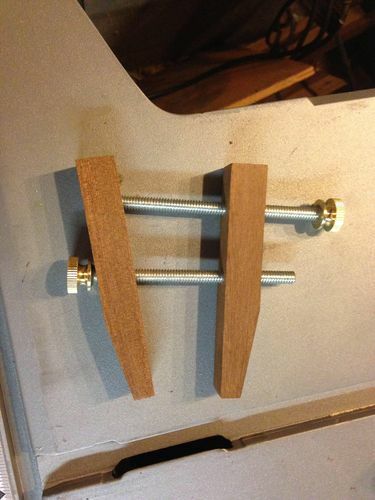 A guy can never have too many clamps! Nice job and a good size for small parts and you know I like that!!! 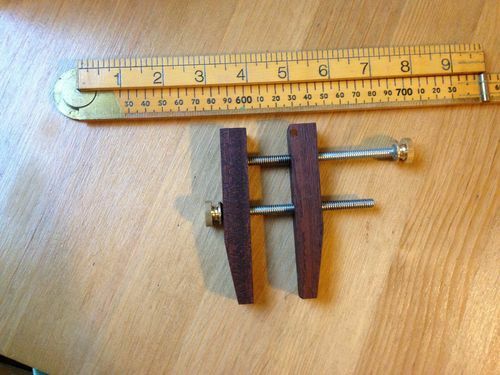 I have 4 screw clamps with the reverse threaded rod, and one old all wood with action like you have here, and I’ve found this all wood clamp to be the easiest to use, it is much easier to get parallel jaws with it. I like ‘em, Dave! Did you embed a nut into the wood or put threads into the wooden parts? I like em, Dave! 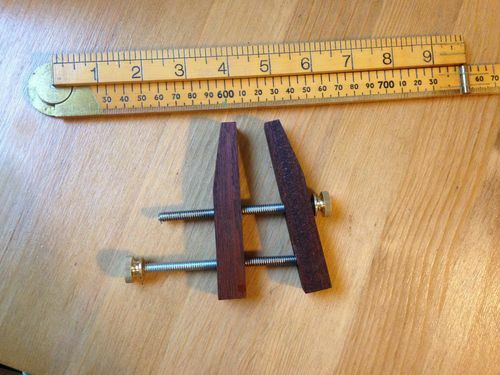 Did you embed a nut into the wood or put threads into the wooden parts? I just threaded pilot holes drilled into the wood. It’s definitely just light duty clamp. How did you make the screws? The heads look like an item from Lowes/HD that threads onto steel all-thread. I have some machinist clamps I made years ago for, which are the same as yours except they are all steel. I like yours for their small size; a great project for left over scraps of wood. It’s exactly as you said. I glued brass knurled nuts to some threaded rod using epoxy. Not the cheapest solution, but I have a soft spot for brass.